In working on an overdue update on road projects, I discovered an item that slipped under my radar two weeks ago. 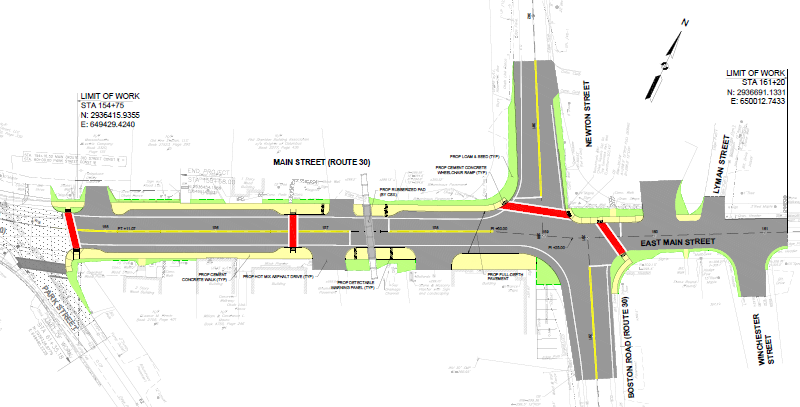 Selectmen approved $1.2M in spending to extend the Main St Reconstruction project to the Downtown Business Village and make other connected improvements. Most of these items stem from requests and updates made by Public Works Department Superintendent Karen Galligan to the Board of Selectmen at their June 7th meeting. Galligan told the board not to expect work on the TIP project to begin before November. (Between the lines, even November seemed unlikely for actual shovels in the ground.) She explained that there was a silver lining in the delay. She believes the Town will be given enough notice that she can create a Gantt Chart to keep the public informed about what, where, and when project work will be happening. I followed up with Galligan who confirmed that she considered the ask approved. She describes the downtown reconstruction will cover the from the TIP project’s end at Park St to Boston Road. Galligan told me the new approval will also continue a sidewalk down to and around the corner of Newton Street to the medical center. That is not indicated in the plans that she shared. But plans indicate that work may continue down East Main, including the Winchester Street intersection. The Town is also working on getting CSX to improve the railroad crossing on Main St.
Work will include drainage, sidewalk and road improvements from the end of the TIP project to Boston Road. . .
There’s not much that can be done within the right of way in the downtown, so when the work is done it won’t look very different than what is there. 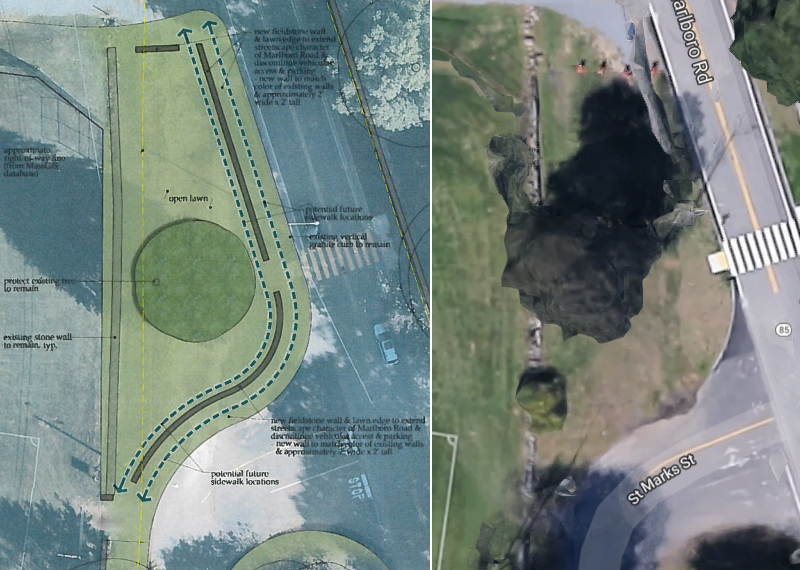 The width isn’t changing, everything is just getting replaced with the same materials as the Main Street project. So what people will notice will be that the concrete sidewalks will be replaced, the asphalt sidewalks will be concrete sidewalks, there will be new pavement and the crosswalks will be the epoxy brick and the wheelchair ramps will be formalized. In response to my questions about public involvement, Galligan indicated that she believed that is done. Public Works Planning Board invited in all of the downtown business owners to a meeting where they reviewed the concept plans. She is treating the project “more like a regular road paving project”. Direct abutters were notified, so she won’t be seeking more public input. At this week’s meeting, selectmen will consider revising the charge for the Main Street Reconstruction Working Group. Town Administrator Mark Purple confirmed that whether or not the new work should be covered by that group will be discussed. Galligan posted the concept plans for downtown to the Town’s website today. Click here for Colored Concept Plan and here for the full plan set. Galligan said that she still needs to send the new information to Mass DOT. 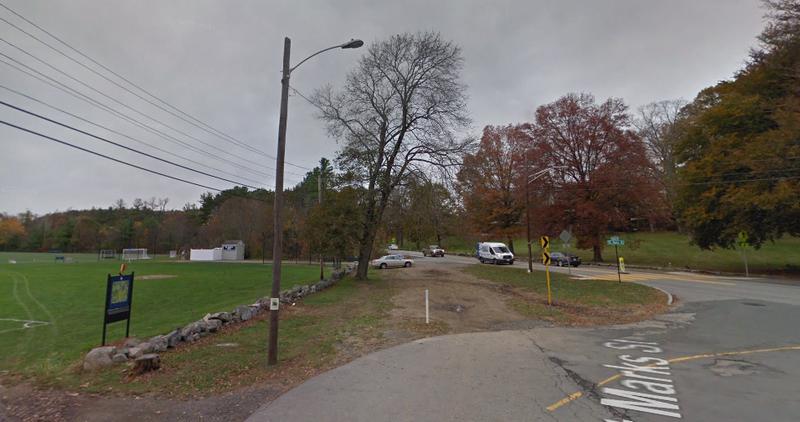 Southborough is giving St. Mark’s School the right to beautify the northern corner of the intersection of Marlborough Road and St. Mark’s Street. According to Galligan, the school will receive a license allowing them to do the work and maintain it. The Town will continue to own the land. Plans shared with selectmen showed that a stone wall will be built close enough to the road to prohibit parking on the grass. But selectmen were assured that enough room has been left to allow for a future sidewalk if ever needed. Selectman Brian Shea asked where parking will go. A Business Manager from the school responeded that it currently allows 10-12 cars. He assured that the school’s parking across the way is enough to allow for that. He also pointed to the area on the south side of St. Mark’s Street as a place where people park. 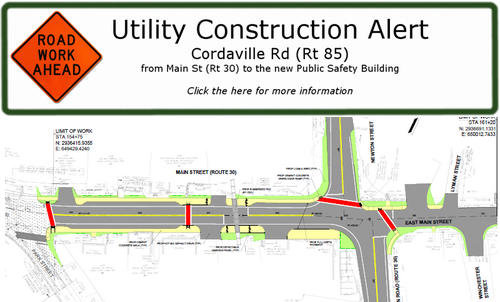 The Town is warning that the Gas company will be installing a gas main from Main Street south on Route 85 to the construction site for the new Public Safety Complex beginning Jun 26th. For the same road section, Galligan got approval for Public Works to lay down it’s water main overnight in a few weeks. It will be one night-time shift in July from 8:00 pm – 4:00 am. The targeted night is Monday, July 9th with follow up day time work on Wednesday, July 11th. Area residents whose water will be turned off will be notified. Speaking of laying utility lines underground. . . In the past, David Parry unsuccessfully lobbied for the Town to underground power and cable/internet lines along Main St. Local news may be prompting him to raise the issue again. The distribution line that currently exists on Main Street is a main distribution feeder for Southborough and other towns as well. The reliability of this feeder is a main concern of National Grid and relocating our equipment off the public way would compromise our ability to maintain our facilities in a timely manner. Town officials had also worried that it would delay/derail the project which had been slated to begin in February/March of this year. But now the project is already delayed. And it’s not far fetched to think it won’t begin until next spring. It looks like a recent vote by Hopkinton Town Meeting has prompted Parry to look at the issue again. Parry’s note to me indicates that the voter approved funds covered the gap between the state funding and Town costs. It’s likely accurate, but without more context – it may mislead. According to a presentation posted for voters by Town officials, the gap between the total project cost and the state TIP funding was double the approved borrowing. Hopkinton voters were given a total project estimate of $14M. But only $8M of that was eligible for TIP funding. The Town presented that $3M of that funding was available in place through something referred to as HCA’s. (Given the Article’s language, that may refer to Chapter 90 funds.) Voters were approving covering the other half of the gap. At the time voters approved the Southborough project (fall 2016), it was estimated as a $7M project fully funded by the state TIP. There was acknowledgement that the Town may choose to spend additional money (possibly from Chapter 90 funds) on above standard sidewalks, crosswalks, etc. *Editor’s Note: If you’ve closely followed the Main St project discussions over the years, you are probably familiar with TIP and Chapter 90 by now. But many readers may not be familiar with the jargon commonly used by Town officials. Chapter 90 funds are apportioned to the Town by the state to reimburse expenses for approved projects such as “Capital Improvement Projects for Highway Construction, Preservation and Improvement Projects that create or extend the life of Capital Facilities”. ***The MassDOT reconstruction project ends at about 5 Cordaville Road. Plans presented to voters who approved the project noted that the Town would extend the sidewalk as far as the current sidewalk already goes – to and past the Senior Center to the north driveway for the cemetery. Congratulations to Hopkinton, for recognising and grasping the unique opportunity presented to them. Their historic Main St is going to be reconstructed using State funding, just like Southborough’s Main St. But Hopkinton town leaders saw the opportunity and supported spending additional local funds to significantly beautify their new Main St, where it passes through their historic downtown — by removing the ugly poles , and undergrounding the wires. Their argument was that the historic downtown deserves special treatment and it’s beauty will influence values throughout the entire town. Southborough could have done the same. Future generations will ask why we failed to do so, when we had such an opportunity. The entire width of Main street, from the RR to Sears Rd, (“entire” means wall to wall — asphalt, grass, trees, sidewalks, drains) — all that width is going to be excavated to 3 feet deep, and more, along it’s entire project length. I want to emphasize that the failure to take advantage of this opportunity was not the fault of the “Main St Working Group”, which is (or was) a citizens group established relatively recently, to oversee the final design, during the climactic final year of design. Far from it, because the Working Group was deliberately restricted in their assignment. In fact, it was actually forbidden from examining undergrounding — by our Board of Selectmen — which created the Working Group, whose principal purpose was to salvage the project after it failed (initially) to get the necessary approval votes at Town Meeting. That failure was focused on inappropriate scale, traffic, and ugliness. The Working Group did their best to tweak the design, but were highly constrained, because State money cannot be spent on beautification. They tweaked the design enough to get approval, and they did improve the design. … Because now our neighbors Marlborough, Hudson, and now Hopkinton, will all have removed the overhead wires through their downtowns. But not Southborough, even though we are the wealthiest per capital, and most beautiful town of all. I am not volunteering to take up this cause, again, just because Hopkinton succeeded. No, because I think it is now, unfortunately, far too late. And it is utterly futile given the stubborn resistance of our DPW and elected representatives. Look at how Hudson’s downtown has been transformed. Beauty does matter, a great deal. And despite promises from our Selectmen, Town Meeting was never even given a say. The fundamental problems from day one have been the lack of attention to the design of our town center, as opposed to a focus on traffic planning. And the lack of meaningful citizen participation until too late. I feel certain that many residents will regret this. Just wait till they see the existing poles being replaced by new, taller poles, just a few feet away, and strung with more wires. Will someone else take up this cause? I doubt it. I think it would be wonderful to beautify downtown main street by burying the wires, but at what cost $$$, and at what ‘opportunity cost’ (pay for this, but no remaining resources for that). I wonder how vigorous Mr. Parry’s support would be if he didnt live on Main Street (and directly benefit from any such improvement). Thank you for your comment. I will simply repeat the facts. The purpose of Hudson and Hopkinton (and numerous other towns , such as Franklin and Holden), removing their overhead utilities through their historic centers, was not to benefit the interest of abutters. NO. It was to benefit their ENTIRE towns — by making their centers more attractive. Town centers are the focal point thru which entire towns are known, remembered, and valued …. As proven by the fact that real estate agents take their new prospects to the town centers, and not just to individual houses in remote subdivisions. Furthermore. These towns only did this ( removing overhead utiities) when unique opportunities arose — as in the case of massive road reconstruction. In a similar vein … Why did we get over 90% vote to save the golf course? (Giving up just 6 acres to the new Public Safety Complex). It was not primarily to serve the interest of golfers. We don’t have remotely close to 9O% golfers. It was because of the importance of saving beauty. ( In this case of manicured open space and vistas, which were threatened by proposals to use the land as a site for other municipal uses). Also, why did we vote over $1 million to place preservation restrictions on the Burnett House …. Once again, it was not done to serve the self interest of abutters. NO. It was to save significant beauty, and enhance it, reflecting the values of our beautiful town. Your point on costs is, of course, very important. I agree. But that is why it is so unfortunate that cost estimates for undergrounding were NEVER thoroughly addressed. We might have come up with a scheme which was cost effective and limited in length. NEVER TOO LATE. Common sense dictates that if other towns can do this, this town should take a hard look at exactly what Hopkinton is doing and the cost — RIGHT NOW. BOS CHAIR: Can you ask the working group to take a look at Hopkinton and the costs? ADVISORY: Can you also take a look — talk to Hopkinton? Those costs certainly do not look excessive. This is a once in a generation opportunity to get it right. This is worth a look-see. Of the $1.2m line item expenditure, how much of this taxpayer funded money is state money (Chapter 90 funds) and how much is local taxpayer dollars? Is this some combination? or is it all Chapter 90 / state funds? Regardless, even if all Chapter 90 funds, doesn’t a line item of this magnitude call for a MENTION of the dollar amount (buried in the BOS package) and discussion of the basics so the PUBLIC UNDERSTANDS WHAT IS BEING VOTED ON? In my humble opinion, this sliding through of this line item without a detailed discussion and mention of possibility of cost over-runs (even if remote) to the taxpayers of this town is simply unbelievable. PS — Was former Selectman, Mr. Parry RIGHT(?!) about the possible cost and potential opportunity to have utilities put underground via the Hopkinton example?. If Hopkinton can do it, why can’t this town? Not to mention the fact that he was vilified and harassed terribly and unacceptably by his political opponents. In my opinion, those individuals need to move on. Services no longer wanted or required. Time for change: This is UNACCEPTABLE CONDUCT for any public official in any capacity. No more slandering and/or harassment of those with opposing opinions; there must be open discussions in the spirit of Open Meeting Law (including fair and balanced public opinion / public comment); and there must be full disclosures and better, more complete transparency. Fellow citizens, there is a need for a BOS recall provision at the next annual or special town meeting. Enough is enough. There certainly is a need for recall, impeachment. There is but one BOS member who really does have the citizens interests as the priority. Can you guess who????? The rest of the BOS have proven and shown exactly how little we are considered, our opinions, and the lengths they will go to, for their own causes or their buddies. Next post: Obituary: Elizabeth (Fish) Butler, 90.